The Barber dime was first minted in 1892 as part of the barber coinage. The dime is 90% silver and has a melt value of $1.08 Melt price live and based off current silver price of $14.98 oz. After the passage of the Coinage Act of 1890, most coins used for circulation in the U.S. were redesigned and standardized. After a public competition for an artistic design provided no suitable candidates, the Director of the Mint, Edward O. Leech directed Chief Mint Engraver Charles E. Barber to make the design. After much discussion and several redesigns later, one design was approved by President Harrison and his cabinet in November, 1891. 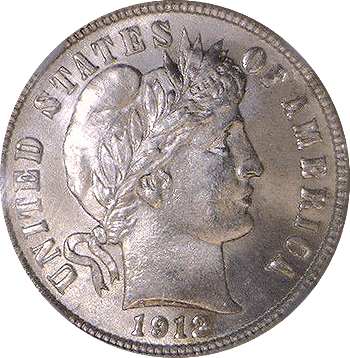 The Barber Dime began production in January, 1892 and continued through 1916 when they were replaced by the Winged Liberty (aka Mercury) Dime. According to government legislation (the Coinage Act of 1837), the metal content of the Barber Dime consisted of 90% silver and 10% copper. A Barber Dime weighs 2.5 grams and is 17.91 millimeters in diameter. Once the weight of many coins was standardized in 1872, these specifications became the standard for silver coinage until 1965. Over 504 million Barber Dimes produced over it’s 1892 to 1916 production run from the Denver, San Francisco, Philadelphia and New Orleans Mints, the Barber Dime is quite prolific in collectors circles. Common pricing for most in poor to even good condition is under $100 with poor coins being as low as $5. There are few exceptions to this with the 1893/2 overstrike and the 1895 micro O being highly notable. The most notable is the 1894-S of which only 24 were minted as gifts from the Superintendent of the San Francisco Mint to notable bankers. 3 of these were given to his daughter who spent one on ice cream (which later may have been found in a junk box in Gimbel’s Department Store) and 2 of which she sold in the 1950’s. 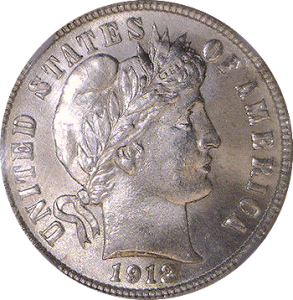 The last one of the 1894-S Barber Dimes to sell at auction went for $1.9 million in 2007.